Due to the premiere on the 7th of May in New York, Chris Teerink was invited to the ‘Leonard Lopate Show’ on WNYC radio station. Since the beginning of this year Icarus Films does the distribution of ‘Sol LeWitt’ for the USA and Canada. Today is the USA premiere at the famous Film Forum, New York. The film will be screened until the 13th of May and director Chris Teerink is also attending the screenings of 8th and 9th of May (both at 8:25 pm). The film already received praising reviews. At the Festival International du Livre sur Art et du Film (FILAF) which took place from the 26th till the 30st of June in Perpignan, Chris Teerink won the FILAF d’Or. The price for best documentary. Last week Sol Lewitt was screened three times during the ArtFIFA and three times it was sold out. Besides these successful screenings Chris Teerink also won the award for best portrait. After the successful screenings in Chasse Cinema in Breda and Museum De Pont in Tilburg, Sol LeWitt is going to be screened in the following months at Filmtheater Hilversum, Cinema Middelburg and Lux in Nijmegen. The screening in Middelburg is in cooperation with museum De Vleeshal who organises a lecture on conceptual art by Lorenzo Benedetti. The film is also selected for the filmfestival Bosch Art Film in Den Bosch, DocVille International Filmfestival in Leuven and ArtFIFA in Montreal. This week Sol LeWitt will be screened during the Festival International de Programmes Audiovisuels (FIPA) in Biarritz. The festival will take place till the 27th of January. Kunsthal KAdE in Amersfoort organises in cooperation with Filmtheater De Lieve Vrouw and Doc.Eye Film a lecture about conceptual art and a guided tour through the museum. Afterwards there will be a screening of Sol LeWitt at De Lieve Vrouw. From today on till the 16th of January Sol LeWitt will be screened daily at 19:30 at the Smart Project Spaces in Amsterdam. Today Chris Teerink is guest in the radio show ‘VPRO De Avonden’ and will be interviewed by Emmie Kollau. Listen here to this interview. This month Sol LeWitt is being released in Dutch cinemas, among them the new and prestigious EYE Film Institute. The first screening in EYE will be accompanied by a lecture about conceptual art given by Franz Kaiser, curator at the Gemeentemuseum in The Hague. Sol LeWitt will be shown to a an international audience during the IDFA (International Documentary Film Festival Amsterdam). On Sunday the 14th of October there will be a special screening of Sol LeWitt in Cinema Lumiere in Maastricht along with a performance of the composer of the film music, Rutger Zuydervelt, in the Cupola of the Bonnefantenmuseum where Sol LeWitts Walldrawing Spiral #801 is being exhibited. The world première of Sol LeWitt will take place during the Nederlands Film Festival in Utrecht on Sunday the 30th of September. 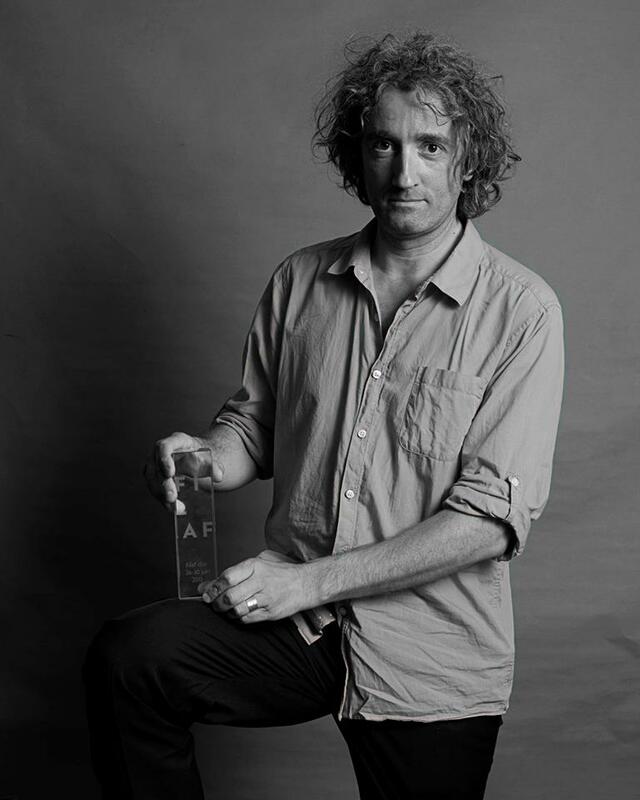 Director Chris Teerink with his FILAF d'OR!